Kevin was originally scheduled to play in a guitar duo but illness interfered. Ann Craig (flute) stepped in and, on Saturday night, we were joined by Brian Paulusz (who was available to play guitar at 5 minutes notice but for only 20 minutes), giving Frank O’Brien (bass) just enough time to travel from his previous set! 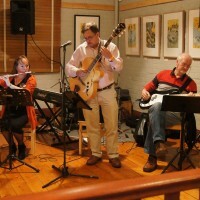 On the Sunday, Ann, Kevin and Frank settled into some playing when Anne Hayres appeared, joining the trio with some vocals. On both occasions, the audience was enthusiastic and supportive.